For almost two decades, Peterson Lawn has provided lawn care services to residential and commercial properties in Minnetonka, Eden Prairie, Edina and the surrounding areas. We offer mowing, fertilization, weed spraying, bush trimming, gardening and some light landscape work. 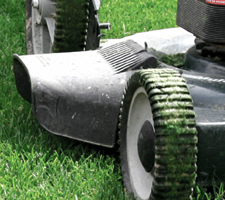 At Peterson Lawn, we understand the importance of having a yard with lush, green grass that is neatly trimmed. That is why we hire experienced lawn crews who love what they do, and are dedicated to making your yard look the way you want it to. If you’re looking for quality, affordable lawn services in the western Twin Cities suburbs, please stop by our shop near downtown Hopkins, or contact us at 952-252-3301 for a free estimate. Tom is the owner of Peterson Lawn Services (est.2000) and our sister company Peterson Salt & Water Treatment (est. 1987). This company stemmed from his personal interest in plants and landscaping, and it has now grown to include a gardening team and four mow crews. Tom oversees operations of both businesses and does a lot of work for us—both in the office and out on site. At home, Tom enjoys walking his dog, grilling, and going to estate sales. He’s known best for his love of sports radio, working outside—and emojis. Landscape designer Nick is a recent University of Minnesota alum with a Bachelor’s of Science degree in Plant Science and Chemistry. Nick studied plants in the Peruvian jungle last spring, but we know his first summer at Peterson Lawn Services will be a more exciting adventure, obviously. When he’s not making lawn estimates, providing labor on site, or training in new landscapers, Nick gushes to the office staff about his undying love for plants and cookies. We think he’s a keeper! Gardener Kristi has a Master’s Degree in Evolution and Ecology, with a special interest in natural prevention methods. Kristi has done extensive research on invasive plants and is very passionate about using natural prevention methods to remedy problem areas. When she’s not gardening for us, Kristi helps the DNR with weed management in forestry operations. Her educational background, love for wild life and strong artistic abilities make Kristi one of Peterson Lawn’s finest! Ali came to our company from Arizona last summer, and has served as an asset to our team ever since. She oversees all the day-to-day operations of Peterson Lawn Services, so it’s likely you’ve spoken with her on the phone. If you ever have questions about billing, the lawn services we provide, or lawn estimates, Ali is here to help you! Midge has been working for Peterson Lawn Services since 2016. She is a full-time administrative assistant and marketing coordinator for both Peterson Lawn Services and Peterson Salt & Water Treatment. Although she works mostly on the salt side of our business, she is happy to help you or direct your call to the right person! John has worked for Peterson Lawn Services and Peterson Salt & Water Treatment since 2015. He’s done everything from lawn mowing to salt deliveries, but currently he’s a full-time member of our office staff. As our main water softener sales representative, he does work mostly for Peterson Salt, but he also generates lawn estimates in spring and summer. If you call our office in the morning or early afternoon, you’ve probably spoken to Peterson’s newest (and bubbliest!) part-time office staff member, Erin. She may be new, but she’ll be sure to help you get the answers you’re looking for.